This product is a rapid battery charger containing an LCD display with a high performance microprocessor and specialized operating software. 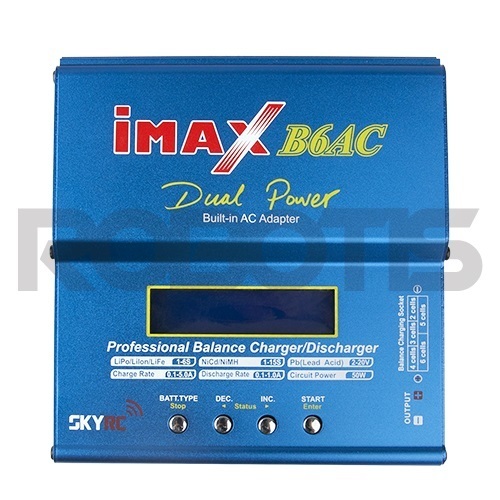 The B6AC features an AUTO function that sets the feeding current during the process of charging and discharging. For Lithium batteries, it can prevent overcharging which can lead to an explosion due to the user. It will disconnect the circuit automatically and sound an alarm upon detecting any malfunction. All of the programs of this product are controlled by a two way communication to achieve maximum safety and minimize user interaction. All of the settings can be configured by the user! Please refer to the official site for more information.